This paper proposes a combined method for two-dimensional temperature and velocity measurements using temperature sensitive particles (TSParticles), a pulsed ultraviolet (UV) laser and a single high-speed camera. TSParticles were synthesized using ion-exchange particles and Eu(TTA) luminescent dye. The size and material of the particles for synthesizing TSParticles are selectable. TSParticles respond to temperature changes in a flow and can also serve as tracers for the velocity field. TSParticles were seeded into a heated water flow in a complex-shaped channel constructed of MEXFLON resin, which has a refractive index exactly equal to that of water. Particle images of flow beyond the structure can be recorded without any distortion. 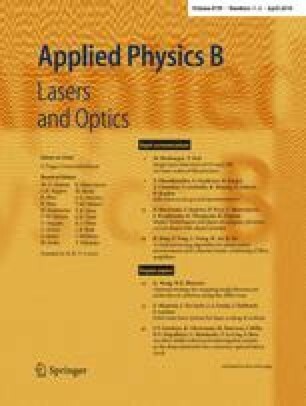 The TSParticles were excited by the UV pulsed laser and the luminescence from the TSParticles were recorded at 40,000 frames per second as sequential images for a lifetime-based temperature analysis. Another advantage of our approach is that high time-resolved PIV can be carried out without a high-frequency laser. The recorded images were also used for the particle image velocimetry (PIV) calculation.